ChessMaine: Delay Mode or Bronstein Mode for Time Delay? Delay Mode or Bronstein Mode for Time Delay? 01.16.10 In a open letter to Maine tournament directors and the Maine chess community, Rob Shore lays out a cogent argument preferring Bronstein mode (add on) vs. Delay mode (countdown) for digital clocks with time delay. We look forward to comments from readers on this interesting article. Most digital clocks are capable of Delay mode and Bronstein mode. Most of the tournaments in Maine these days are played at "Quick" rating speed...G60 or even G45. The official USCF Rule Book suggests that, to help players deal with time pressure in these sudden death time frames, Tournament Directors use a form of time shifting. The rule book says that a time increment is the equivalent (exactly equal) to a time delay (see p10, USCF rules). Maine TDs invariably allow for a 5 sec/move delay, but many won't allow for a 5 sec/move increment, under the mistaken impression that it "adds too much time to the game". In G60 tournaments, players have the option of setting the clock at 55 minutes with a 5 second delay. What this means is that the players have set 300 (5 x 60) seconds aside in a "time bank". This means that, at 5 seconds per move, it takes 60 moves before the player gets his/her 300 seconds back. Since most games finish in less than 60 moves, these games are usually shorter than G60s without the delay. A time delay gives the 5 Sec/move back before the move. A time increment gives the same time back after the move. In either case, it is only 5 seconds from the time that had already been set aside. The one significant difference between an increment and a delay is that with an increment, a person ALWAYS gets the full 5 seconds that he/she is supposed to, while when using a delay, a person often does not get the full 5 seconds due him/her. Case in point: I'm in time pressure (under 5 minutes to play). Someone checks me and I'm forced to make an "only move" to get out of check. If I play the "only move" in 1 second and hit the clock, I never get the other 4 seconds back. But with a time increment, I always get the full 5 seconds as soon as I make the move. •Delay and Increment both give the exact same number of seconds per move. The only difference is that delay gives the 5 second prior to clock starting while the Increment gives it after the move has been made. •Virtually all USCF and FIDE tournaments that use time shifting use the Increment instead of the Delay. The Increment is becoming the standard for quick play tournaments. Therefore, I would request that Maine TDs allow players to use a time increment in the sudden death games that comprise so many of the tournaments held in Maine. I would also ask that the new leadership of the Maine Chess Association review this request and consider promoting this as standard practice. I never understood the time delay. I think it is mostly for players with no time left so they can hold off the final moment indefinitely and hope for a draw. I am for no time delay, period. You are out of time, you're dead. Who started this anyway? Bobby Fisher? I think that Rob Shore has confused Fischer mode with Bronstein mode. The rule book says that Bronstein and delay are equivalent, but not Fischer and delay. Bronstein is non-cumulative addback, that is after you move you get the time you used, up to five seconds, returned to you. Fischer is cumulative addback, that is after you move you get the increment period, not usually as few as five seconds, added back to your time. In Fischer mode, it is possible to actually accumulate time. If you play quickly enough, you may finish with more time than you started with. Not so with Bronstein. These are very different, and it isn't really fair to have some players in the same tournament using one and some using the other. In my Portsmouth Open, the time control is GAME/110 + a 10 second increment. One player got as low as 8 seconds, before he built his time back up to almost a minute. Please note also that deducting time for a delay clock is a non-preferred option. Even though many tournament directors use it, it is standard to have GAME/60 be 60 minutes with a 5 second delay. Shore is correct about Fischer being standard internationally, but in the USCF, we still commonly use delay, and I'm not aware of any organizer who uses it in the U.S. except for FIDE-rated tournaments. One difficulty for tournament directors in allowing other modes other than delay is necessity to understand the clocks each individual is using to know if its is in fact using Bronstein mode or Fischer time mode. Bronstein is equivalent to delay however the typical increment on a clock might be different (adding back time that may not have been lost). Bronstein delay—with the Bronstein timing method, the increment is always added after the move. But unlike Fischer, not always the maximum increment is added. If a player expends more than the specified increment, then the entire increment is added to the player's clock. But if a player has moved faster than the time increment, only the exact amount of time expended by the player is added. For example, if the delay is five seconds, the player has ten seconds left in his clock before his turn and during his turn he spends three seconds, after he presses the clock button to indicate the end of his turn, his clock will increase by only three seconds (not five). Fischer—before a player has made his move, a specified time increment is added to his clock. Time can be accumulated, so if the player moves within the delay period, his remaining time actually increases. For example, if the delay time is five seconds, and a player has four seconds left on his clock, as soon as his opponent moves, he will receive the increment and have nine seconds to make a move. If he takes two seconds to move, then on the start of his next move he will have seven seconds. There is also a variant of this time control which the delay is added after a player has made his move (Fischer after), so that the delay is added to the player's remaining time, and will be available for his next move. If however time runs out during his move, the game ends without the delay time being added. This variant prevents the player who is in time-trouble to take advantage of the extra-time. 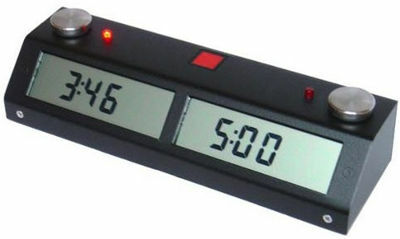 Simple delay—when it becomes a player's turn to move, the clock waits for the delay period before starting to subtract from the player's remaining time. For example, if the delay is five seconds, the clock waits for five seconds before counting down. The time is not accumulated. If the player moves within the delay period, no time is subtracted from his remaining time. This time control is similar to a Bronstein with time added before the move. if tournament directors are willing to review the clocks manual and know for a fact that the proper increment is being used then there should be the right to use it however the player and tournament director really needs to understand the individual clock to use it properly.